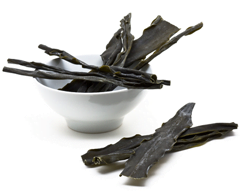 Kombu (or Konbu), is a sort of dried kelp (which is a sort of sea-weed) used in many Japanese cuisines including sushi. Kombu is considered to be an important ingredient in creating Umami (savouriness). You probably already know that Umami is a loanword from Japanese meaning “good flavor” or “good taste”. How to use Kombu in sushi? When preparing the sushi rice, just before you turn up the heat or start the rice cooker, throw in a small piece of Kombu. About 5 by 5 cm of Kombu should do for an average 3 cups rice batch. It is helpful at this point to make slits in one or more sides of the Kombu to help release its flavors. Where can I get me some Kombu? As in most sushi ingredients, you can find Kombu in your local Asian food store or Japanese market. This product is also available on our online store and through the link below.